Update 6/7/15: TAKE THIS, State Department! You can't arrest all of us. This is a America, morons. We have a 1st Amendment right to talk about our 2nd Amendment rights, or anything else we want. The 2013 North Carolina Dixie Deer Classic show is coming up, and it's got me thinking about gearing up for spring hog hunts and deer hunts this coming fall. Ol' Backwoods hears all kinda tales about what does and does not work in hunting cartridges. Some folks say a 16" AR firing .223 is inadequate for deer, while others say with the right bullets and loads, it can be done. Of course, the mainstream media is all over the place, from claiming "an AR-15 cannot be used to hunt deer" to 'deer would explode from being hit with the high-caliber bullet of a Bushmaster assault rifle'. Yeah, buddy. Some folks claim it ain't legal or ethical to hunt deer with .223, but only Indiana has a direct prohibition, as far as I can tell (and prohibited in Virginia, 4VAC15-270-10 -- thanks Jake). In North Carolina, it's fully legal, as it is in other states. As far as the ethics of it, as long as I'm confident I can follow the blood trail to a dead deer in a reasonable amount of distance-- say, 100 yards or less, I think the shot is ethical. I think I have found a bullet / powder combination that just might work on the small deer we have in North Carolina, and additionally on feral hogs of smaller stature. Our deer ain't that big, dressing out under 200 pounds in most cases. Amazing performance on deer in the .223 Remington! Fully aware that the general consensus lies in the BELIEF that the .223 is inadequate for deer, I still wanted to hunt with my AR-15 (.223 Rem) so I did my research and decided to give these bullets a try. Accuracy out of my 20" 1:8 Bushmaster Predator was quite good with five shot groups consistently under one inch. With a max load of H4895, [muzzle] velocity averaged 2913 ft/s which I calculated to produce 1343 [ft-lb muzzle energy]. I had full confidence that this load would perform well as long as the shot was placed carefully, but I was surprised to find that it handled a challenging quartering forward (through the shoulder) shot with ease (Whitetail Deer 125lbs dressed). The shot hit the leg bone squarely totally shattering it. It then smashed through a rib bone shattering it. 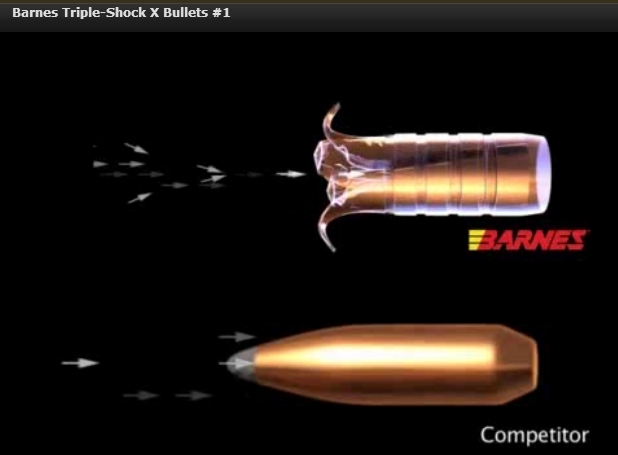 The bullet continued through the heart and lungs and then exited on the far side. Measuring diagonally, the bullet penetrated more than 17" of deer. The deer ran a short 50 yards and expired. With increased confidence in this load, I continued hunting and was able to take a second deer with the same results. Shattered leg bone, shattered rib, destroyed heart and lungs, and exited on the far side. Down within 50 yards! The only downside to this bullet/load combination is that the entrance hole was small and the exit [hole] was only about 3/4" in diameter. [The] blood trail was light, but still easy to follow after the first 25 yards. In summary, I highly recommend this bullet to anyone that would like to use the .223 Rem on deer. My AR's have 16" M4-type barrels with a 1 in 9 twist, which should be able to stabilize this bullet better than the reviewer's 1:8 twist, though his barrel is 2" longer than mine; I'll lose a tiny bit of velocity. Hmm, 23.5 grains of Hodgdon 4895 for a max load. 2879 FPS is pretty close to what our reviewer above got, 2913 FPS. The load-test rifle had a 24" barrel, which you'd think would bring a larger velocity than our reviewer's 20" AR, but it didn't. Hydraulic pressure from bodily fluids start the expansion process quickly. Well, we'll see. I got some 70-grain TSX bullets on order from Midway USA. It's AMAZING to actually find some .224-diameter bullets in stock ANYWHERE, but Midway does indeed as of this writing have them in stock. I got a pound or two of H4895 laying around, too. I'm gonna load some of these TSX's up, and shoot them into gelatin out at my buddy Jim's farm, and see how they do. I'll post an update when we're locked and loaded. It is really a shame to destroy the heart. That is the tastiest part. "Some folks claim it ain't legal or ethical to hunt deer with .223, but only Indiana has a direct prohibition, as far as I can tell." It's also prohibited in Virginia (4VAC15-270-10). A .23 caliber rifle is the minimum. It's listed in the state's brochures, but the specific regulation is a bit tricky to find. Thanks, Jake. Article has been updated. Been using 223 4 years now. It has been an awesome round for deer hunting. I usually use 62 grain Tsx or federal fusion. Shot placement Is the key and consider range of the deer...I try to keep shots under 225 yards.. I just bought a Smith n Wesson AR and I have scoured the net regarding the use of this round! Considering the empirical evidence, terminal ballistics etc.... I am confident that I can take deer at reasonable distances of 150 yrs or less with federal fusion 62grain bullets that group at 1.25 with stock sights. Shot placement! Any well placed round will drop a deer as will any misplaced shot allow a deer to run off! It is as simple as that! Thanks for the comment, fly. I haven't gotten a chance to try out my new load on ballistic gel, but if the weather improves this weekend, I just might. Washington state hunting regulations also require a minimum bullet diameter of .243, so no .22 centerfires allowed for deer here. Hit a deer in the shoulder with a 223 and its going down!!!! The folding hunting pocket knife is a more versatile type of knife. They are the most compact, and, quality brand is purchased,guidance sports the folding pocket knife can easily clean game.